In today's Dirty Dining, a sushi bar that previously had always made the grade. LAS VEGAS (KTNV) — In tonight's Dirty Dining, a sushi bar that previously had always made the grade. As 13 Chief Investigator Darcy Spears explains, it's an example of how one bad day in a chef's personal life can have big consequences. When we arrived, we found the sushi bar's C grade hidden behind a container. We pointed that out to the owner and he moved the container out of the way, then directed us to the sushi chef to answer our questions. Sam Kim says all those demerits they got on March 7 stacked up under some pretty crazy circumstances. Sam Kim: Let me explain what happened that day. My wife was missing so I was filing out a missing persons report with the police department. My daughter was missing as well. Darcy Spears: Are they okay? Sam: Yeah, we found them later. She left the house like 6 in the morning to drop my daughter off at school, never came back to the house or returned the calls. Her phone was out. So I was very worried. I was on the phone calling the hospitals and the police department. He says in the midst of all that, the health inspector showed up. "Because I was on the phone with the police department, I could not assist her and explain different things," Kim said. The inspector found them using a cloth with no sanitizer to wipe down the cutting board. Avocados were not washed before being cut. And rice, cream cheese, yum yum sauce and ginger sauce were in the temperature danger zone. "Because I had to deal with the police department, I didn't put it away. So that's the thing. That was why the temperature was higher than it normally is." There were also utensils stored in lukewarm standing water. "Normally we have ice but by the time I finished my call, the ice had melted already." The inspector also photographed Windex and an employee's cell phone on a prep table, which Chef Sam says is really just a shelf--not a place where they were preparing food. "What about the sushi chef using bare hands to prepare food?" Darcy Spears asked. "That's not normal either," Sam said. "And for some reason... I don't know why he did that. So I made sure that he didn't do that anymore." There was also excessive dirt, build-up and food debris on floors. "Floor was dirty behind--underneath the shelves where we couldn't really reach. We took care of that." 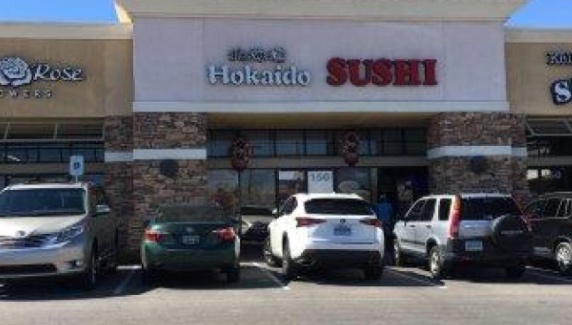 Chef Sam says Hokaido's business is based mostly on repeat, local customers. "They know the quality of our food and they know we do our best to maintain a high standard and I think they come back because of that." "So you just want them to look at this as one bad day?" Spears asked. "It was a bad day. Well, it was a bad day for the restaurant but for me it was a really bad day. Hokaido was reinspected March 20 and is back to an A grade. But we've got one other place to talk about. Santiago's Taco Shop on Twain and Swenson was shut down for an imminent health hazard after inspectors found a sewage leak on March 7. They also found salsas and raw el pastor at unsafe temperatures, and plastic bags of raw beef and a bag of cooked chicken were stored together in the same bin in the cooler. Also, the food truck's C grade card was hidden from public view. Santiago's was shut down due to a failed re-inspection, plus the imminent health hazard. It was back to a 3-demerit A grade on March 12. The owner told us the wastewater issue was due to a full drain tank that was leaking. He said they've since had it repaired and redesigned to prevent anything like that from happening again in the future.